At Stedman Community Hospice in Brantford on October 4, 2018. Lynne Robertson, aged 67. Loving Wife of Glyn Robertson (48yrs), Mother of Chad (Naomi) of Hamilton and Doug (Beth) of Kitchener. Proud Grandmother of Owen, Madelyn, Gavin, Tatum, Liam and Simon. 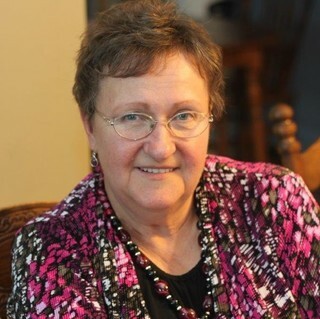 Sister of Richard Kniaziew (Pauline) of Leamington, Ontario, lifelong friend of Mary Hrynkiw of Brantford and Sister-in-Law to John (Karen), Bill (Susan) and Bob. Lynne was born in Stryi, Ukraine to Bazyli (William) and Sophie Drab. Lynne was a lifelong learner having earned many certifications including Hairstylist and a Level III Palliative Support Worker certificate which allowed her to progress to her most fulfilling role with the Red Cross. Despite being diagnosed with Multiple Sclerosis in 1992, Lynne continued to enjoy an active lifestyle. Cremation has taken place and a mass will be held on Friday, October 12, 2018 at 11:00am at St. Basil Catholic Church, 50 Palace St., Brantford, Ontario. The family will receive guests immediately following in the parish hall at 12:00pm for light refreshments arranged by the Catholic Women’s League. Donations in Lynne’s memory can be made to Stedman Community Hospice in Brantford or the MS Society of Canada.